I’d like to thank Ross Kemp for hosting us today. And I’d like to thank everyone who has been part of today’s gathering. Let me thank all of the speakers who are with us today, Mary Creagh, Valerie Amos, Emily Berrington, and Adjoa Andou. Let me start today by saying that all of our thoughts are with the people of Nepal. We have seen truly appalling scenes as a result of this earthquake. We now know thousands have lost their lives and we know British nationals have been caught up in this tragedy. We must ensure that all international efforts support Nepal during this desperate time. All of Britain will today be sending our thoughts and sympathies to the people of Nepal. The world will come together. We will do everything in our power to help you in your hour of need. Now today I want to talk to you about the great causes of our time that today’s event is about. We are an internationalist party. We have always been an internationalist party. We are a party that believes in the importance of equality. We are a party founded on a belief in equality. And these great causes of internationalism and equality come together in 2015. 2015 is a crucial year because of our general election. And 2015 is also the year when we must reaffirm our determination and our fight to build a better world. And today I renew our Party’s commitment. And because it defines who we are as a country. And I want to talk to you about the once in a generation opportunity that 2015 gives us, and the difference a Labour government will make. I grew up in the 1980s. The era of Live Aid. The era when international development seemed a forgotten subject. The era when if you had said Britain would become a country that was going to be a world leader on development, people would have said it wouldn’t happen. It happened because of a Labour government. But here is the truth, it didn’t just happen because of that government, it happened because of all of you. The people who campaigned, who demanded who would not take No for an answer. It is your efforts that made it possible. And there is no greater sign of success than the fact that spending 0.7% of our national income on aid is now enshrined in the law of land. Now some people will tell you that this aid isn’t well spent, that it can’t make a difference. All of us have a responsibility to show why that is not the case. UK aid helped drive us towards meeting the Millennium Development Goals. And as a result, today, 17,000 fewer children die every day. More people than ever have access to clean drinking water. We have begun to reverse the spread of Aids. Nine out of ten children in developing regions attend primary school. That’s 58 million more children in education than 15 year’s ago. The Millennium Development Goals have shown how we have made a difference. How we will make a difference. The world came together, worked together, and has saved lives together. Let us applaud that work. And let us tell all of those parties including UKIP, who threaten this aid, that we are proud of what we have done. Not as a matter of charity but as a matter of justice. We are proud to be a country honouring our responsibilities to the world’s poorest countries. But because we are the Labour Party, we focus not on the work already done, but the work we still have to do. 6.6 million children under the age of 5 each year die from preventable causes. 31 million girls do not attend primary school. A billion people suffer each year because they cannot obtain the health services they need. And more than a billion people still live in extreme poverty in our world. These are the facts about our unequal, unjust, unfair world. But these facts are not immutable or immovable. The Millennium Development Goals showed it. And we have a responsibility to ensure that the new Sustainable Development Goals can show it too. In just five months’ time we have a unique opportunity to make a difference again; when the world comes together at the UN General Assembly in September. And we must seize the opportunity with the power of example and urge other countries to step up to the plate and commit to 0.7%. The benchmark of whether you are doing your bit. And we must seize the opportunity by arguing for universal health coverage not just here but around the world. I promise you this: with a Labour government, we will protect and defend our National Health Service. And we will also establish a new centre for universal health coverage, bringing the insights and expertise of our NHS to bear in helping the world’s poorest people have access to healthcare. We will champion the values of the NHS all around the world. And we will recognise the importance of economic development, companies playing their part in building a better world. So we will engage with the private sector, supporting best business practice both at home and abroad. And friends that means the right practices in relation to tax. Let us tell the truth: tax avoidance is not just wrong, it is ruinous for the world’s poorest countries. When companies exploit natural resources and don’t pay their fair share, it deprives developing countries of the revenues they need for healthcare, education and public services. It deprives them of the very chance of development that is so often urged upon them. So we will champion the fight against tax avoidance at home and abroad. No hiding place in the tax havens, no loopholes in the tax system. And we won’t any longer tolerate a situation where the richest countries obtain information about who the tax avoiders are but don’t share it with the poorest. This too is a basic matter of justice. And we will also work with companies to ensure they have sustainable supply chains, free from slavery. And that they treat their workers fairly and pay taxes where they are due. This is an agenda where the next Labour government will build an alliance with business and the private sector, so many of whom recognise the importance of doing all of these things. And a central part of our campaign must be the fight against inequality. We see today that nearly half the world’s wealth is owned by just one per cent of the population. Inequality scars our society, and it scars our planet. It doesn’t just make some of us poorer, it makes us all poorer. So I will put the struggle against inequality at the heart of the settlement we make in September. And 2015 is not just a moment when we must act to tackle global poverty and inequalities, but where we must act on climate change. Nothing matters more to the generation that is just growing up than protecting our environment. If we do not tackle climate change, millions of people will fall back into poverty. Because we know that climate change hits the poorest hardest. Let me tell you: I won’t be the kind of politician who puts a wind turbine on my roof and then calls for a moratorium on wind turbines. I care about climate change not just because it was once fashionable, but because it matters to the future of our world. And with each year that goes by, the evidence grows stronger not weaker. Here too, we will lead by example. 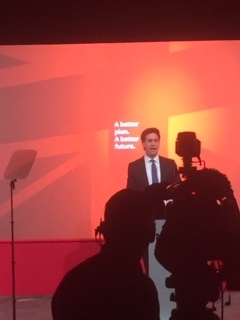 The last Labour government was the first government in the world to set binding targets in law for reducing emissions. The next Labour government will be one of the first in the world to take the carbon out of our electricity by 2030. And leading by example we will urge the world to act. Let me tell you what we must achieve in Paris at the crucial talks this year. A plan based on the scientific evidence. Preventing warming of more than 2 degrees. And a plan to make it possible for the world’s poorest countries to grow in a sustainable way. I will do whatever it takes, to get this deal. And in climate change and in international development, it is about political leaders and the job we do. The summits later this year are vital to ensuring the world moves together. But it is also about something else. In the end, don’t believe the idea that it is political leaders who change the county, or change the world. It is movements and people that really change the world. Just look at the great changes we have seen throughout history: they would never have happened without a movement. History shows us that real change comes only when there is public pressure and political will. That means you in this room. So I am asking you to stand with me, I am asking you to fight with me, I am asking you to be the movement that helps build change in our world. To end global poverty and inequality. To fight for health and education. And to make it happen, let me say this to you finally. It will only happen if you make it happen by making a Labour government possible in the next 11 days. By knocking on doors, by going out and campaigning, and by telling people how we can change things. As a movement, we have always fought against the odds. And that is true of this election. And we know what it means, we keep fighting till the very end. Till 10pm on May 7th. We have 11 days to elect a Labour government. And 11 days to change our country.